Beautiful HEN & ROOSTER Black Bone Baby Trapper Handcrafted in Germany HR422BPB This handsome new knife has never been used or re-sharpened, and comes with a Limited Lifetime Manufacturer's Warranty. It is 2 3/8 inches long(folded/closed) and weighs approximately 1.1 ounces. The blades are German Stainless Steel. The handle is picked Black Bone with a Hen & Rooster Inlay Shield. The bolsters are Nickel Silver. So, if you're looking for a great knife to collect, carry, or give as a gift... don't pass this one up! 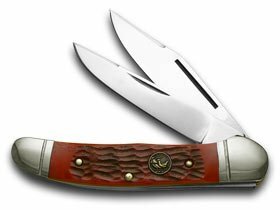 Beautiful BUCK CREEK Red Bone Large Stockman Handcrafted in Germany BC-659RPB Big DiamondbackThis handsome new knife has never been used or re-sharpened, and comes with a Limited Lifetime Manufacturer's Warranty. It is 4 1/4 inches long(folded/closed) and weighs approximately 4.1 ounces. 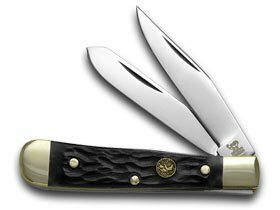 The blades are highly polished German Stainless Steel and the Tangs are stamped with the Buck Creek Logo on one side and German Stainless Hand-Made on the other. The handle is picked Red Bone with a Nickel Silver Buck Creek Inlay Shield. The bolsters are Nickel Silver. So, if you're looking for a great knife to collect, carry, or give as a gift... don't pass this one up! 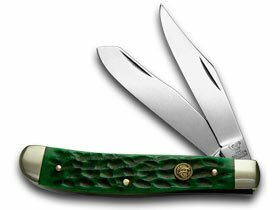 Beautiful HEN & ROOSTER Green Bone Medium Trapper Handcrafted in Solingen, Germany HR412GPB This handsome new knife has never been used or re-sharpened, and comes with a Limited Lifetime Manufacturer's Warranty. It is 3 7/8 inches long(folded/closed) and weighs approximately 2.8 ounces. The blades are highly polished Solingen Stainless Steel. Solingen Steel is regarded as the Highest Quality Knife Steel in the World. The handle is picked Green Bone with a Nickel Silver Hen & Rooster Inlay Shield. The bolsters are Nickel Silver. So, if you're looking for a great knife to collect, carry, or give as a gift... don't pass this one up! 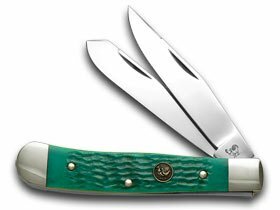 Beautiful HEN & ROOSTER Green Bone Trapper Handcrafted in Solingen, Germany HR312GPB This handsome new knife has never been used or re-sharpened, and comes with a Limited Lifetime Manufacturer's Warranty. It is 4 1/8 inches long(folded/closed) and weighs approximately 3.5 ounces. The blades are Solingen Stainless Steel. Solingen Steel is Regarded as the Highest Quality Knife Steel in the World. The handle is picked Green Bone with a Hen & Rooster Inlay Shield. The bolsters are Nickel Silver. So, if you're looking for a great knife to collect, carry, or give as a gift... don't pass this one up! Beautiful HEN & ROOSTER Red Bone Copperhead Handcrafted in Solingen, Germany HR232-RPB This handsome new knife has never been used or re-sharpened, and comes with a Limited Lifetime Manufacturer's Warranty. It is 3 3/4 inches long(folded/closed) and weighs approximately 3.4 ounces. 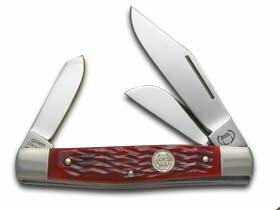 The blades are highly polished Solingen Stainless Steel with Hen & Rooster World's Finest Cutlery and logo etching. Solingen Steel is regarded as the Highest Quality Knife Steel in the world. The handle is picked Red Bone with a Hen & Rooster Inlay Shield. The bolsters are Nickel Silver. So, if you're looking for a great knife to collect, carry, or give as a gift... don't pass this one up! Looking for more Pickbone Handle similar ideas? Try to explore these searches: Mission Style Corner Computer, New York Giants Beanie, and Scotts Company Soils.